Find a particular blog post from Rabia Chaudry, Susan Simpson or Professor Colin Miller. Before Undisclosed podcast was even a twinkle in Rabia’s eye Colin and Susan (and Rabia herself) were all prolifically writing about Serial. 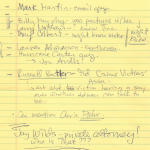 Many discoveries that were later included in the Undisclosed Podcast, or even Justin Brown’s arguments in court, first appeared in those blogs. Skim through our linked index page if you are looking for a particular Serial/Adnan Syed related post. Newest posts are shown at the top. If you don’t remember the date, or might not recognise the blog’s title, use this search which only looks through those three sites. Just look for a word or phrase, in either the post itself or the comments. Many of the documents uploaded in the blogs were also loaded onto the wiki. We haven’t linked them all here, but you can recognise most of them from the filename prefix: STMB for Rabia’s “Split the Moon” blog, VLL2 from Susan’s “The View From LL2” blog, and EVPB from Colin’s “Evidence Prof Blog“. 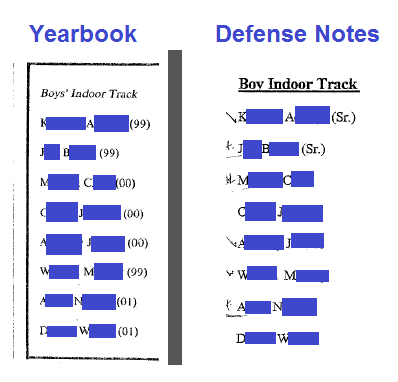 The trial transcripts were mostly provided by Rabia and they have different file prefixes of T1 and T2. To avoid pointless duplication if a file was also shared on the Undisclosed website, we just used that version (prefix = UD followed by the episode or addendum number). 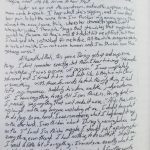 Some of the blog docs do not make much sense without the surrounding text so they were not loaded on the wiki, including the individual tower cell phone maps and the clay burial position models from Susan’s blog. From Susan Simpson’s Jan 24 2015 blog post. 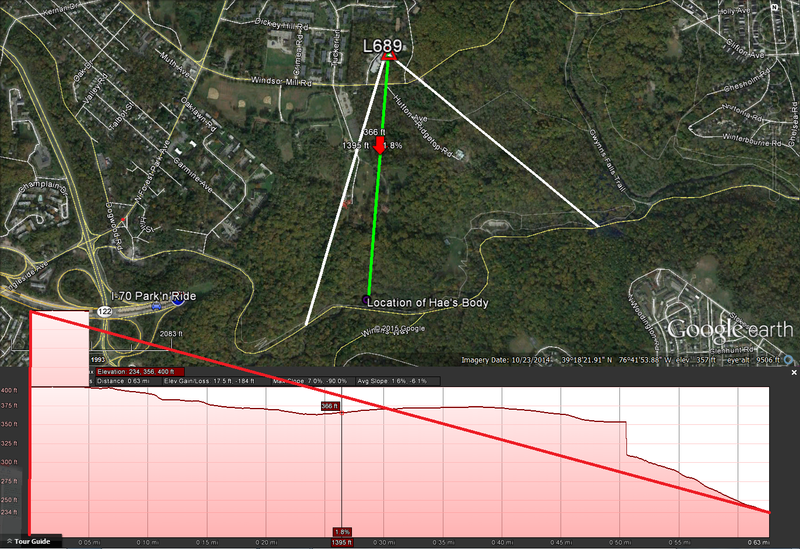 Elevation profile from cell tower L698 to a point east of Hae’s burial site on N. Franklintown Road, line of sight so likely some signal. 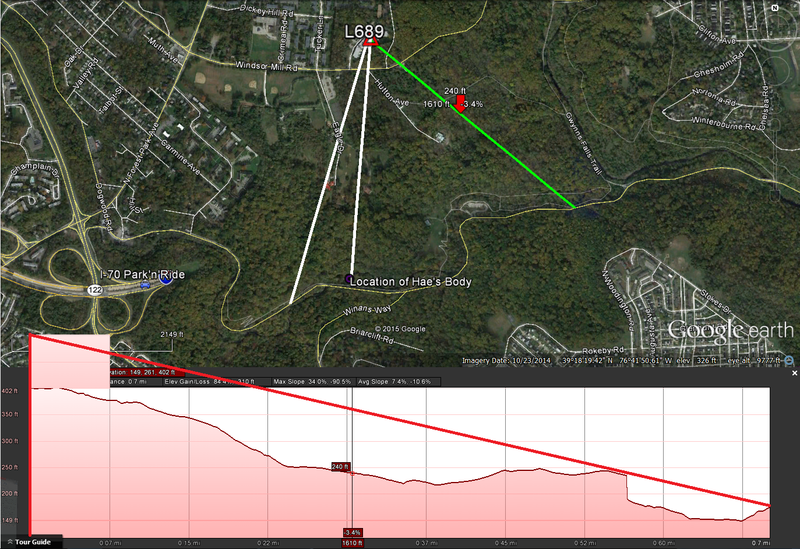 Elevation profile from cell tower L698 to a point near to Hae’s burial site but on N. Franklintown Road not in the woods, no line of sight so signal is unlikely, burial site would have been deeper in the signal shadow of the hills. 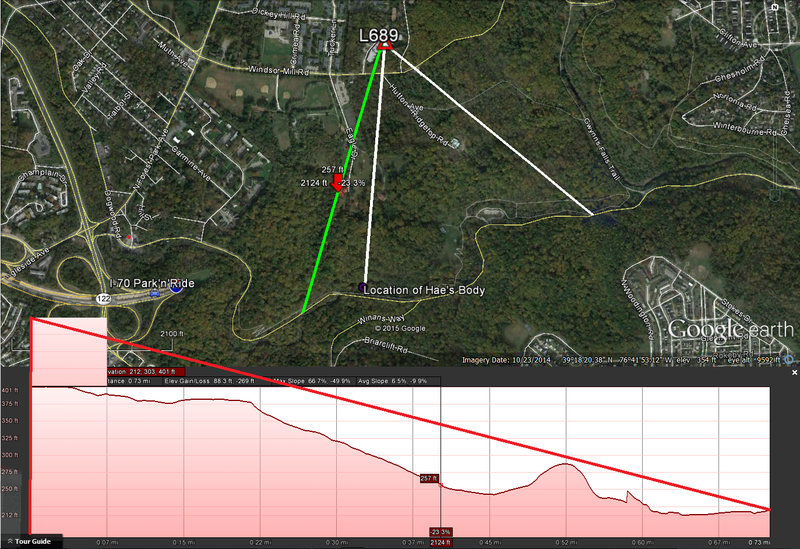 Elevation profile from cell tower L698 to a point west of Hae’s burial site on N. Franklintown Road, line of sight so likely some signal. From other posts on Susan Simpson’s View from LL2 blog. Attorney Doug Colbert’s affidavit about polling the jury after Trial 1 Also used as an exhibit during the PCR process. Files provided by Rabia, either of her own creation or uncertain origin. First published either on her Split the Moon Blog or her twitter account. 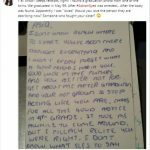 A copy of Jenn P’s police interview from 27 Feb, with annotations by Rabia Chaudry. Prayer times at Adnan’s mosque during Ramadan 2000, which would be very similar to 1999 times. 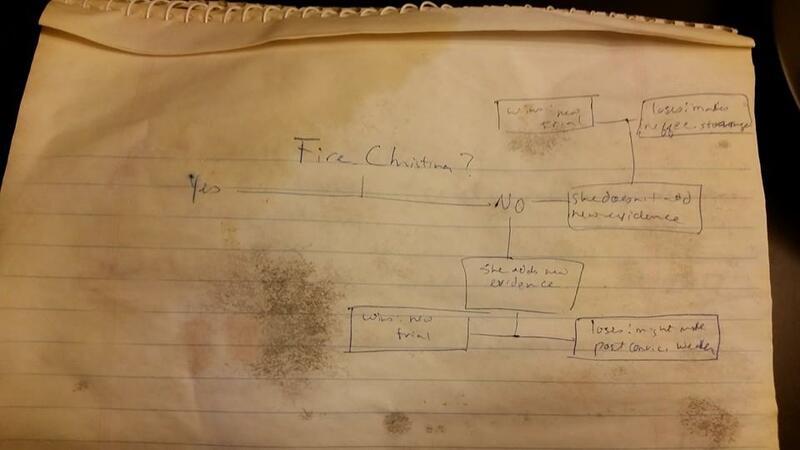 Rabia Chaudry’s flowchart re firing Gutierrez, undated but perhaps between Trial 1 and Trial 2. 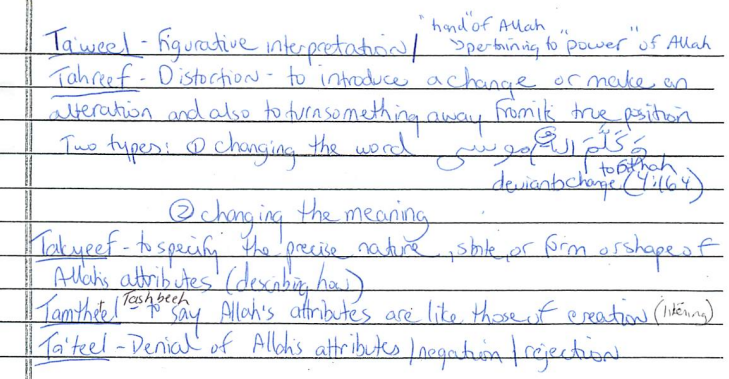 Notes re Mr Patel and what happens in mosque during Ramadan, including Adnan leading prayer. Unknown author, could be Rabia, could be Gutierrez? Typed notes from attorneys Doug Colbert and Chris Flohr about points to emphasise at Adnan’s bail hearing, or bail review. 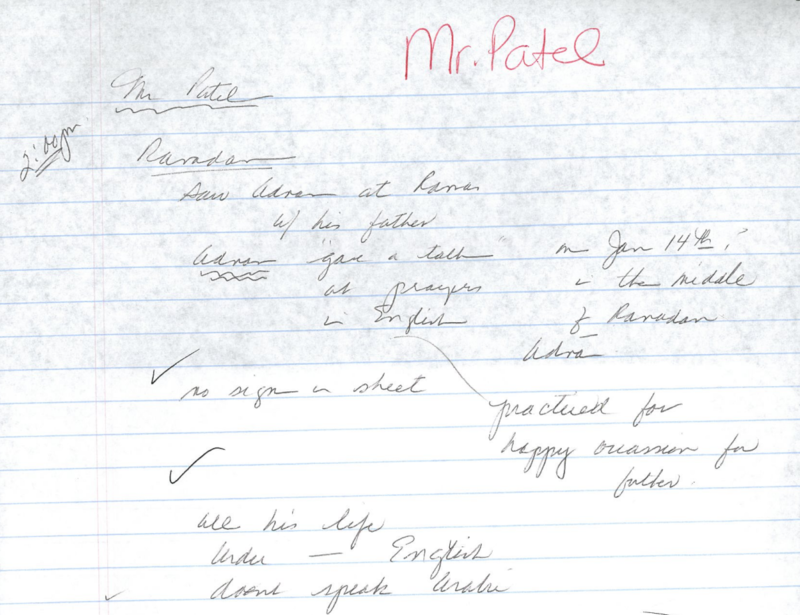 Undated, via Rabia Chaudry’s blog. 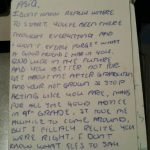 Letter from Adnan to Rabia written in 200 after Sentencing. Not necessarily acquired via ndisclosed. Defense fax, 4/23/99 and Defense fax, 4/26/99 both correspondence about ASA Vickie Wash’s racist arguments at the bail hearing and subsequent apology for misleading the Court. 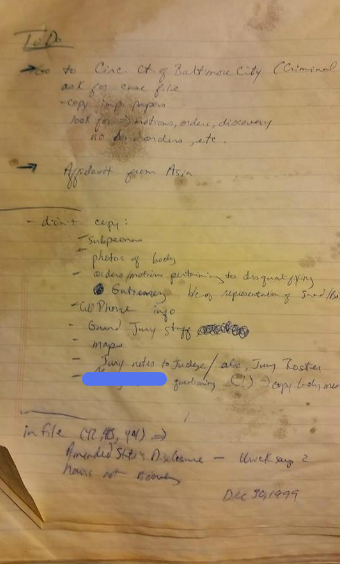 Individual documents extracted from a composite file posted by Undisclosed Podcast with Episode 7.